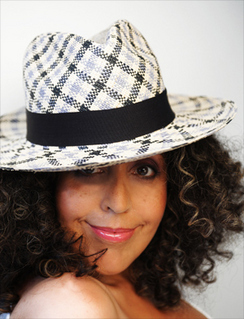 The late Poly Styrene, best-known as the frontwoman for the very seminal though short-lived punk band, X-Ray Spex, finished her album, Generation Indigo, before she'd passed away due to cancer in April. "Ghoulish" is the album's second single. Give it a look/listen and enjoy. All information is courtesy of Sure Shot PR. Although music lost one of its most uniquely idiosyncratic legends when Poly Styrene tragically succumbed to cancer in April, she had thankfully finished recording her Generation Indigo album before being diagnosed, thus providing the 21st century with one of its defining statements, in similar fashion to her uncannily clairvoyant X-Ray Spex missives of the punk era. Following computer-age anthem ‘Virtual Boyfriend’, which trailered the album as first single, comes the rapturous ‘Ghoulish’; sadly Poly’s first posthumous single. Generation Indigo showed Poly as lyrically incisive as ever, still reflecting and commenting on the modern world, from lifestyle and technology to human traits and relationships. The panoramic musical backdrops are suitably bold and brash, sometimes sensually insidious and always compellingly cutting edge. ‘Ghoulish’ is one of the outstanding results of the torrential creative relationship which sparked between Poly and producer Youth, here hot-wiring New York’s 60s girl group sound with sparkling future-sheen and swooping sonic sheets to produce a new strain of spectacular, 21st century pop music. The video is replete with Michael Jackson impersonators, some more comical than others, as Michael was the inspiration for the song. The video, directed by Lauryn Siegel, also features actress Gabby Hoffman. In something of a coup, the single version comes with a killer remix from New York’s renowned Hercules & Love Affair, aka Andy Butler, who drapes Poly’s vocals over an exquisite Moroder-meets-acid house super-groove, with cliff-hanger drop and voluptuous peaks. The fact that one of dance music’s most revered names can obviously revel in turning what started as one of Poly’s observations into a post-apocalyptic disco anthem speaks further volumes about the lady who started as the original punk misfit and now rests alongside the all-time greats.